Running a small or big business (or being a startup in this domain), you must build trust and authority. And this can be achieved greatly by having your customers in touch with you. Online reviews from customers are critical and pave the way for a business to project its authority in the market. Having your business registered at the consumer review websites and platforms, not only give you the insights of customer’s response, but also provides an opportunity to strengthen your online presence. With higher customer interaction and quick responses to their concerns, your trustworthiness is projected while improving search engine rankings. 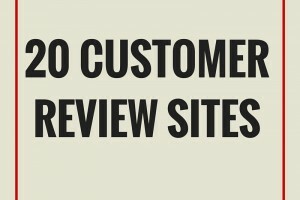 Here is a compiled list of some trusted customer review websites, where a startup business must be registered at first. Some are general sites related to every niche, but some are specific to a particular industry. Facebook is the powerful social media channel to promote your business. And that is why it lets you collect customers’ reviews with its Ratings and Reviews option. On the left hand of a Facebook Page, there is an option ‘Facebook Ratings & Reviews’ that enables consumers/users to rate your services/products. Google+ is a social media platform by Google. While promoting your business on social media is important, Google + Local also gives your business a presence in the search results. Moreover, it gives your customers an access to reviews and ratings of your company. It lets you integrate your Google+ Local profile with other Google properties. Hence, you have a complete control over your business where customers can find out about your business, contacts, reviews and other features. How one can forget Yelp,when it comes to customer reviews? Being the topmost client review website, Yelp is the place where you must register your business instantly. It helps you to be in touch with customers at a higher level by allowing you to respond to their complaints as well. Yelp offers an increased search engine ranking as well. With Yelp deals, page-views tracking and other personalization features, one can convert reviewers into loyal and regular paying customers. If you have angry clients, they may file a complaint on ripoffreport.com, which is the biggest review website for the complaints. Basically, the platform exposes bad business ethics and can seriously affect the reputation of your business if you made any mistake in your business practice (or just have some shady competitors who play dirty). The highly used search engine after Google is Bing. Get your business registered with a quick and easy registration of Bing, that is free. You can also include photos and videos to showcase your brand smartly. Yahoo is another prominent search engine after Google and Bing. Getting registered on Yahoo Local, you get a chance to showcase your business on Yahoo’s Local itself and around the web. The review system is based on a 5-star rating system. It offers you a system to showcase your business by including relevant photos, tagline and an about section. Moreover, placing deals and other promotional offers on your listing will also help you in promoting your business. If you own a service-based business, Angie’s List is the premium customer review platform for you. From home repairers to doctors, accountants, realtors, lawyers and other service providers; all can proficiently utilize this website to acquire insights of customers’ reviews and satisfaction. It is a paid website where users have to pay in order to read and write reviews. That is why it is the most trusted system with no chance for fake reviews or referrals. Angie’s List also lets you respond to customer’s complaints. A fast-growing website based in Denmark, TrustPilot is now expanded over 65 countries in Europe. It is dedicated to help businesses to collect consumer reviews from all over the world. The free version allows you to create a profile page and collect customer reviews. While, the paid version incorporates share ratings, customizable review invitations and more advanced features. It is a rapidly growing business site with over 30 million visitors per month. With the easy creation of business listing, get your business promoted with its advanced features and paid promotion packages. It’s a business accreditation site. Although, the customer reviews do not influence BBB rating, but getting your business accredited at BBB, you can professionally respond to customers’ complaints and feedbacks. With Merchant Circle, you are comfortable in promoting your business to the target audience. It offers free marketing tools to advertise and promote your business in a proficient manner. You are able to be in contact with customers as well as other local businesses. Whenever one looks for travel destinations, airline, hotels or restaurants, TripAdvisor is the name that pops up first. The biggest website for travel and tour reviews – where any related business must be registered. The platform offers many free marketing tools to advertise your business as well as a quick mean to respond to customers’ feedbacks and reviews. OpenTable is a great and convenient plartform for restaurants, cafes and bakeries. Based on a 5-star rating system, this is also an online restaurant reservation website where diners can book their tables easily. Having good customer reviews on this site gives you an opportunity to showcase your restaurant for having more reservations. Although, it is focused on reviews of medical and health care services, but also incorporates customer reviews for restaurants, home and garden services. This is the online phone book. Getting listed your business at Yellow Pages, you can enjoy the features of lead generation, online payment and advertising. A very easy to navigate online directory – SuperPages.com besides listing your business, offers features like lottery results, cars for sale. It is a wide network for restaurants, bars, hotels and spas. You can get your business listed here for free and can build profile in an easy way. Moreover, this platform is in partnership with other vast networks including Expedia,Urbanspoon, Merchantcircle . It is a wide network for the people offering home improvement services. Get listed on Kudzu as 97% of its users are the people who want to make renovations in their homes. It helpls you to create a profile with a dedicated account manager and lets you enhance search engine rankings. With the enhanced profile features, you can manage customers’ reviews and track leads as well. Everyone who is involved in home repair business (like plumbers, roofing contractors, landscaping companies etc.) must get the business listed at this site. Here, the users search for different kinds of home repairing services with the zip code. It displays the relevant search results having the companies alongside their ratings and reviews. It is one more popular directory to get your business listed and engaged with your target clients. You can build a profile to manage trustworthiness of your brand, as well as gives you more insights of advertising. You can proficiently manage your ratings and reviews and also manage leads through reporting tools.